Friday December 6th 1878 We worked all day cleaning up the house and getting the dining room ready to dance in Rob and I were over town awhile in the morning We took May over to have her hair cut. The party was a success, there was an immense crowd here. I worked awful hard but enjoyed it ever so much better than I expected to. Aunty Walker, Aunty Holmes and Lilly Brandon all stayed all night. It was three oclock when we got to bed. It was a splendid light night. 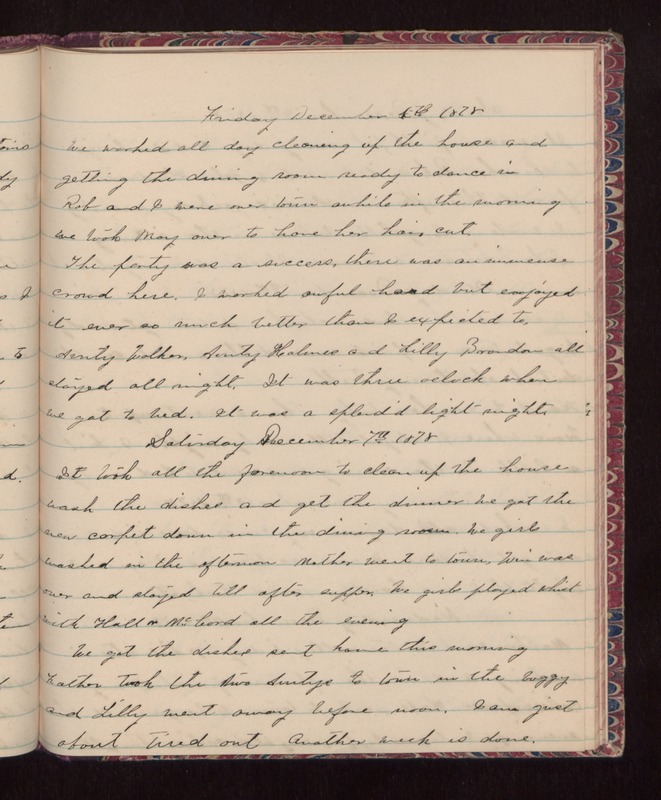 Saturday December 7th 1878 It took all forenoon to clean up the house wash the dishes and get the dinner. We got the new carpet down in the dining room. We girls washed in the afternoon. Mother went to town. Win was over and stayed till after supper. We girls played whist with Hall & McCord all the evening We got the dishes sent home this morning Father took the two Auntys to town in the buggy and Lilly went away before noon. I am just about tired out Another week is done.